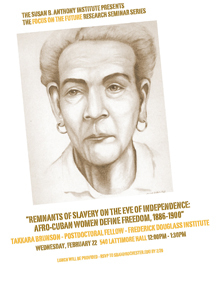 Takkara Brunson, post-doctoral fellow at the Frederick Douglass Institute, will present her work "Remnants of Slavery on the Eve of Independence: Afro-Cuban Women Define Freedom, 1886-1900." Please join us for lunch and discusson! RSVP by February 16 to sbai@rochester.edu.